New Yorker Electronics is distributing the new Cornell Dubilier series of DC link polypropylene film capacitor modules for high-power inverter applications. The MDL series uses the advanced metallised film technology for high reliability and long life in DC Link applications. It provides capacitance values ranging from 600µF to 4,200µF, with applied voltages of 900VDC to 1,300VDC. The series is based on the company’s DC Link film technology using low-loss, high-grade polypropylene dielectric. 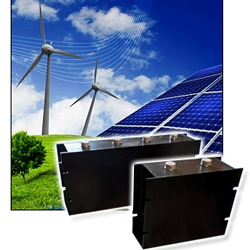 Providing current ratings up to 400Arms these modules are ideal for today’s high-power inverters used in commercial and utility-scale wind, solar and fuel cell systems. Other applications include UPS, switching power supplies and large motor drives. The series provides 12 values in four case sizes, is RoHS compliant, and meets IEC 61071 and UL94V-0. Each unit passes through the company’s industry-leading 100% burn-in testing.